Let me just start with this picture so you know what we’re working with here….. Literally THE BEST THING I have ever consumed. I probably say that about 75% of the things that I eat, but this place was to die for. This is the second installment of my “Throwback Thursday” posts… and I’m actually really mad that I haven’t blogged about this place before. Zinneken’s Belgian Waffles in Cambridge, MA (right near Harvard’s campus) is 150% the most insane waffle I have ever consumed in my life. I absolutely loved everything about our trip to Boston, but this place was definitely one of the highlights. The only thing that even comes close enough to compare is a Minneapolis/St. Paul joint called Black Coffee and Waffle Bar which is known for their designer waffles. But I hate to admit it– this one was way better. If you know me even at all, you probably know that I will eat anything sweet. This “dessert for breakfast” spot was exactly what I was looking for. The menu (below) listed many different combinations with chocolate, caramel, fruit– you name it. 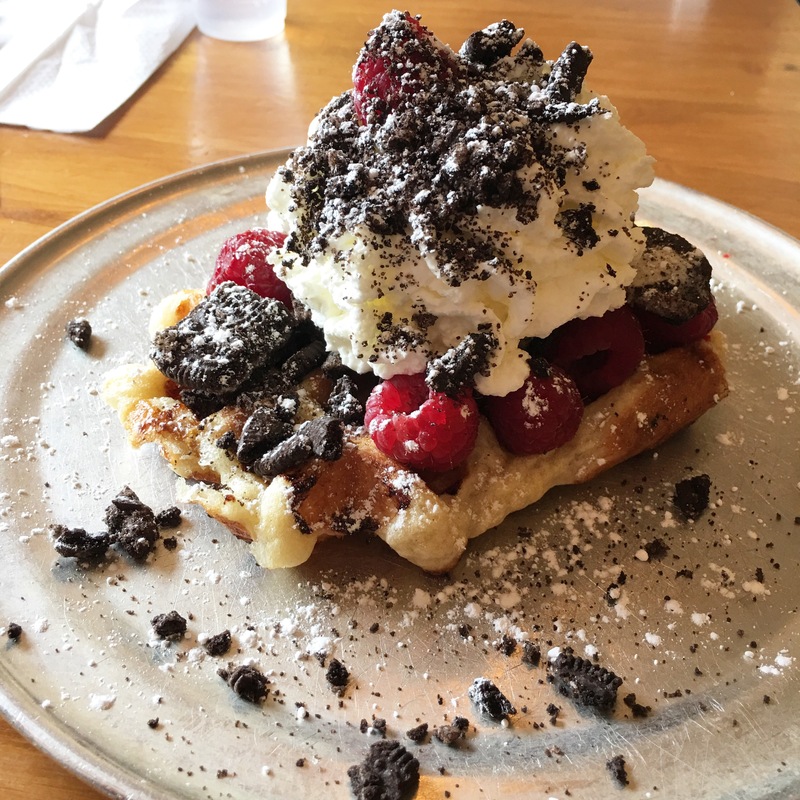 But before we get carried away with the toppings, I should touch on the waffle itself. 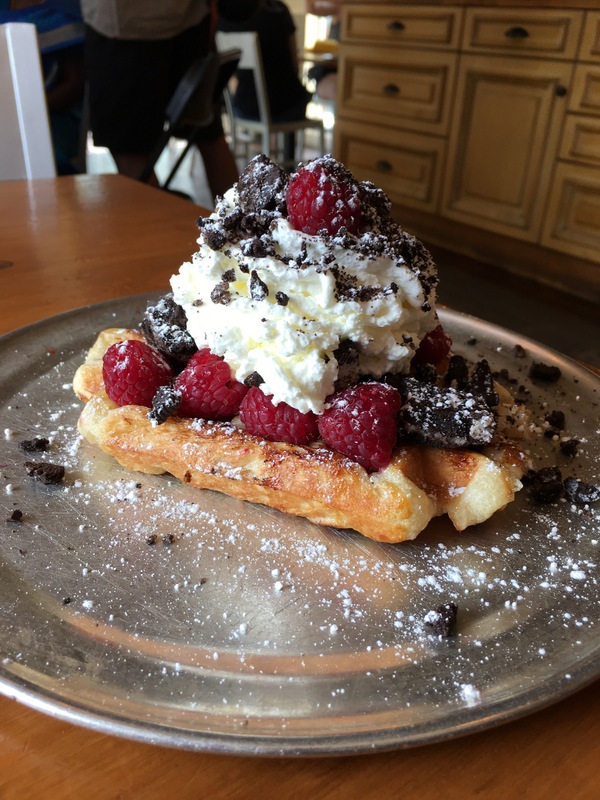 Zinneken’s Belgian Waffles boasts something that not all breakfast places can– they’re totally authentic! The Belgian Waffles are made by “actual Belgians” who know exactly what they’re doing. Unique from other places that offer a similar style of breakfast food, the waffles at Zinneken’s seemed top notch and sophisticated. They were fluffy without being too volunious, crisp around the edges without being too crunchy or hard, and soft in the middle without tasting doughy. 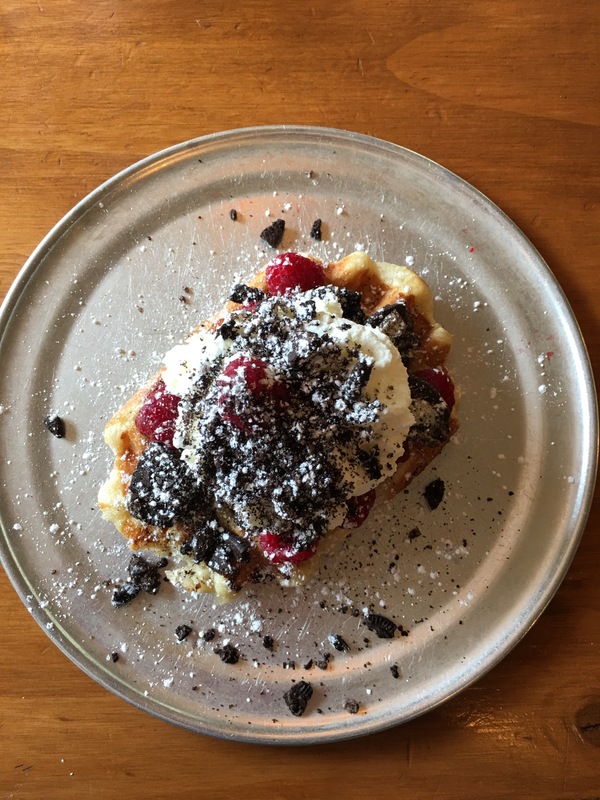 Honestly– the best waffle I have ever had. Of course, since my only goal on vacation is to be as unhealthy as possible, I decided on the “Oreo Freakin’ Party” (duh). 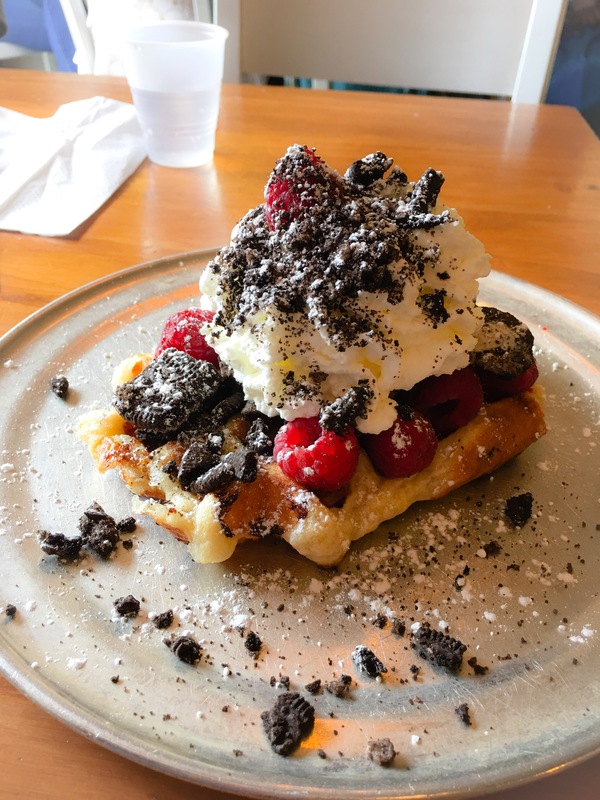 Some of my favorite things– whipped cream (which for sure tasted homemade), Oreos, and fresh raspberries all combines for an absolutely amazing waffle. I wish that I would have been more into coffee at the time that we visited this place, because I would have loved to try one of their hand crafted drinks. I’m not exaggerating, you order your waffle and the employees craft it from scratch in front of you. The longer we sat there and waited, the more time it gave me to think about what it would be like to have a place like this near my campus. I cannot imagine living near this breakfast spot– I don’t think I would ever leave. I also would probably be about 300 pounds, but it would be worth it. Fortunately (and unfortunately), we were only near Harvard for one day of our trip, so we only stopped into Zinneken’s one time. But obviously this spot left a lasting impression on me. Before I leave you with one final picture of this masterpiece (I know– you probably haven’t seen enough….) I have to reiterate the freshness of these waffles! There is a TRUE difference in what we think of as Belgian waffles, and a real Belgian waffle. I cannot stress enough the quality of this small shop. Their website really stresses the authenticity of their waffles. If you ever find yourself in Cambridge, MA this is a place you need to stop by.